Scrubs: check. Gum boots: check. Gloves: check. Tychem suit: check. Mask: check. Hood: check. Apron: check. Goggles: check. Gloves again: check. "Ready?" I ask the Liberian nurse assisting me. She shakes her head and grabs a small strip of duct tape, covering the space between my hood and goggles where a thin slice of skin was showing. "Now ready," she replies. The temperature in Monrovia is just over 80, the humidity even higher. 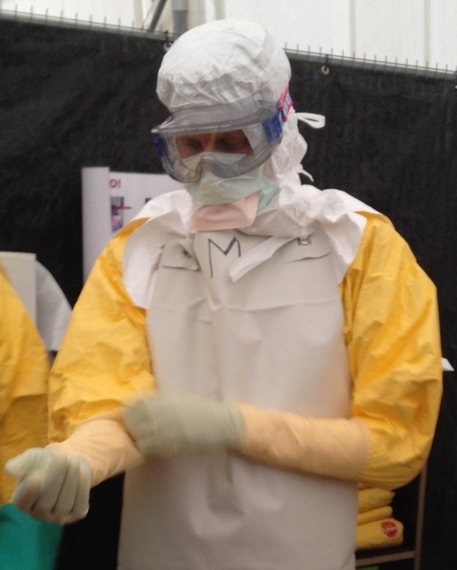 I feel the sweat collecting between my skin and suit, pooling in my boots and along the bottom of my goggles as I slowly follow the physician training me into the high-risk zone of the world's largest Ebola treatment center. It feels far more like scuba diving through a hot spring than beginning morning rounds in a hospital, but that is exactly what we are doing. A few moments later, I meet my very first patient with Ebola, a young man who had wandered away from his bed during the night and is now lying on the ground near the edge of the high-risk zone. He is tired and confused. He doesn't know where he is, or why there are two men in space suits towering over him. The physician with me calmly reassures him, and together we help lift him to his feet and guide him back to his thin mattress in one of the large white tents serving as an Ebola ward. He is profoundly weak, and as we walk, I notice that his pants are soaked through with diarrhea, a hallmark of the disease. We lay him down and urge him to drink some water mixed with oral rehydration salts. Then we move on to the next patient. We have 60 more to see on rounds this morning, and already I feel exhausted from the heat. For decades now, Ebola has been the Hollywood star of diseases, capturing the public's imagination with its exotic name, high fatality, and the added fear factor that it can cause people to bleed from odd places. Until recently, though, if you had asked any global health expert about the scary diseases that keep them up at night, Ebola would not have made their list. Just this past May, at a humanitarian conference I attended in London, one speaker presented some early data collected from Gueckedou, Guinea, where the current Ebola epidemic in West Africa began. After the presentation, one man in the packed audience raised his hand to ask: "Why are we even talking about this disease? After all, it only kills maybe a hundred people every couple years." As of this week, Ebola is killing a hundred people every couple days in West Africa, and there will never be another conference where someone raises their hand to ask that question. But the true impact of the crisis in West Africa should not be measured in the numbers dying of Ebola itself, but rather in the wider impact the disease has wrought. Every day here in Liberia I hear horror stories of people dying of perfectly treatable diseases as hospitals and clinics have shut their doors: a woman in labor who bled to death, baby half delivered, for lack of a midwife willing to manage her delivery; the driver who crashed his truck and was left to die without a functioning trauma center; the young child seizing from malaria, whose mother visited multiple hospitals and clinics but couldn't find one open to treat him. It is not Ebola alone causing the catastrophe in West Africa today -- it is an epidemic of fear. What makes Ebola different from so many other public health threats is the effect it has on healthcare workers, and as a result, on the entire healthcare system. To put it bluntly, Ebola kills nurses and doctors, almost preferentially. This should not be surprising, given that the disease is spread by contact with the body fluids of symptomatic patients, and nobody has more contact with the body fluids of sick people than nurses and doctors. But the toll that Ebola has taken on clinicians and public health professionals alike means that the very people who calmed our fears in the past, who talked us through other epidemics and assured us that everything was going to be okay if we only kept calm and did A, B, and C, are now running scared themselves. And that is frightening indeed. Ebola, though, is not actually a Hollywood disease. It is not a vampire, zombie or ghost. It cannot walk through walls, or even gloves and gowns. It can be destroyed by weapons as simple as chlorine, alcohol, soap, detergent and even sunshine (sort of like a vampire, I suppose). With the right precautions in place, including protective equipment and triage protocols to identify those most likely to have the disease, health care workers can safely treat patients of all types without the fear of dying themselves. And when people see health care workers saving lives, they are willing to bring themselves and their loved ones to the hospital early, before the disease has a chance to spread, reducing transmission. And when transmission stops, the epidemic stops, and life in West Africa can return to normal. Up until now, it has been local nurses and doctors who have borne the brunt of this epidemic, working long hours to care for desperate patients without the proper protection as their colleagues fell ill around them. Yet even now, the vast majority of them are more than willing to come back to work once their safety is ensured by the introduction of protective equipment and protocols. The necessary protective equipment isn't cheap though, and the impoverished countries of West Africa will never be able to afford it on their own. And as brave and heroic as they are, there simply aren't enough trained doctors and nurses here to stem the tide of this epidemic on their own. There is a dire need for the international community to stop treating this crisis like a horror movie, closing its eyes tightly until the scary part is over, and start treating it like a real humanitarian disaster that requires an adequate input of monetary, logistical, and yes, human resources. It is true that most humanitarian emergencies cannot actually be solved by humanitarians alone, but this crisis is an exception to the rule. A sufficient supply of experienced international aid workers, including nurses, doctors, epidemiologists, sanitation engineers, lab technicians and logisticians, provided with the proper protection and resources, could bring this particular crisis to a halt in a matter of months. As we finish our morning rounds, tending to both the living and the dead crammed together in the long white tents of the treatment center, I see something quite unexpected. A large group of patients are dancing and singing in the grassy area between the wards, with a handful of nurses and doctors in their full protective equipment trying to bounce a bit with them, despite the heat. The patients are joyous because they have recovered from Ebola, and will soon be discharged home. I can feel the strip of duct tape tug against the skin of my face as I begin to smile. If the international community is willing to invest the necessary resources now, within a year or so we could all be dancing together as a planet, celebrating the full recovery of the Ebola-stricken nations of West Africa. If we fail to act soon, however, we are going to need some very large, nation-sized body bags. Adam Levine is an Assistant Professor of Emergency Medicine and Director of the Global Emergency Medicine Fellowship at Brown University. He currently serves as the Clinical Advisor for Emergency and Trauma Care for Partners In Health/Inshuti Mu Buzima and as a member of the Emergency Response Team for International Medical Corps. His research focuses on improving the delivery of acute care in low-income countries and during humanitarian emergencies. The views expressed in this blog are his alone and do not necessarily represent the views of any of the organizations mentioned above.